A full Hillside Music Festival recap is forthcoming, but since Day 2 got a quick recap with highlights from the festival and from my on-site Tweeting, I thought I’d give Day 3 the same treatment. Day 3 at Hillside was most notably marked by rain. A lot of it. 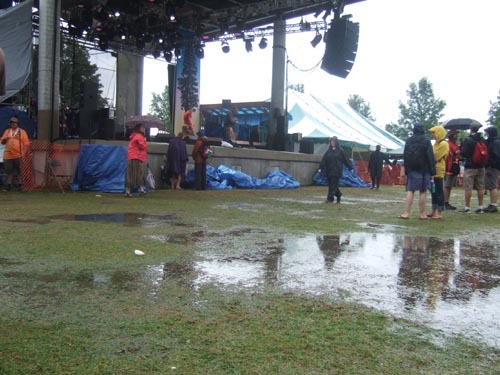 A whole ton of rain and thunderstorms that threw the scheduling completely out of whack for a while, caused huge puddles at the mainstage, and caused several people to feel a mild electric shock from a lightning strike that was just a little ways away and made the ground shake from where we were sitting. One guy got good video of it, along with some people playing in the mud and rain. If you haven’t seen this video, the lightning strike is at 0:35, take a look. Anyway, our pre-thunderstorm highlight was definitely Dancehall Free For All, a fun six-piece from Guelph who managed to rival Ohbijou for the most adorable act of the festival, despite being much louder with occasional screaming vocals. I also caught the last part of Los Misioneros del Norte, who (and I swear this is true) had people doing an impromptu hoedown in front of the stage during their set. Post-thunderstorm, the biggest surprise was maybe David Francey, who played immediately after the storm on the main stage and proved to be the perfectly mellow, charming folk artist to calm the nerves after getting soaked. Later on, the Great Lake Swimmers put on a very tight set and generally making this whole ‘indie rock’ thing look easy. Patrick Watson…well, I like Patrick Watson and his band a lot, and I hate to say bad things about him, but Patrick and most (if not all) of his band were somewhat intoxicated. Patrick was giggling incessantly, which was kind of fun and kind of disconcerting at the same time. We stayed for the beginning of Final Fantasy but left after a couple of songs once the rain picked up again. We were lucky to be in the VIP parking area near the grounds, because reportedly the main parking area was a complete swamp. Someone else took a great video of Final Fantasy playing in the rain; we left just as he was starting this song, and I really don’t know if he even got back on the stage, or if the Skydiggers, who were supposed to play after him, ever got going. I’ll have a final recap of the fest tomorrow. Haha! I guess he figured he oughta burn to warm-up. Lightning is cool. Nearly getting struck by it, not so much.